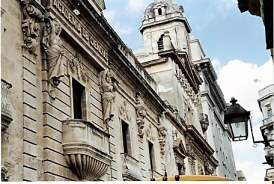 The grandeur of Havana is hard to adequately describe, for it comes well-dressed and it comes in tatters. Either way it has soul and it has style. 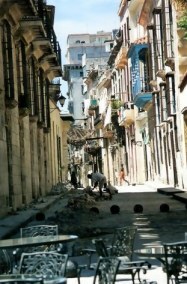 Havana’s old town, Habana Viejo, is a UNESCO Heritage area. 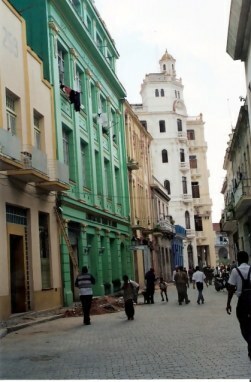 Here, the buildings have been stylishly restored to their original pastel colours. Attention has been paid to accentuate the exquisite detail - as in the fancy wrought iron railings and façade features of this building. 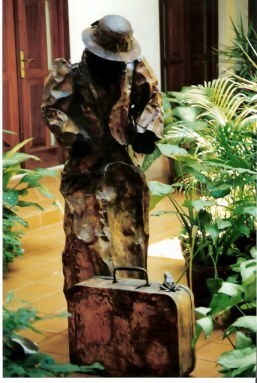 …and this wonderful sculpture inside a hotel terrace, with frog perched on the suitcase of a travelling lady dressed in period costume. Detailed patterns of the iron railings, stained glass, and building detail are all carefully restored to former grandeur. A city shares the same fate as time passes relentlessly on. 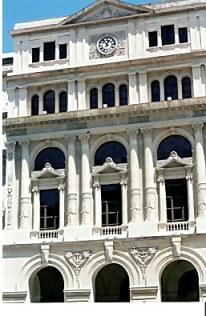 Havana must have been a stunning city in its prime, for it still is now, as you can see in its new finery of paint and repair. 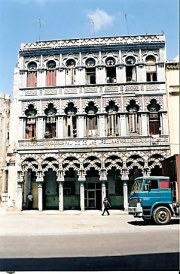 This building illustrates that even without make-up, this is a grand lady whose style and personality are retained, even though un-retouched. There is no denying classic style – no matter how simply adorned it might be at the time. 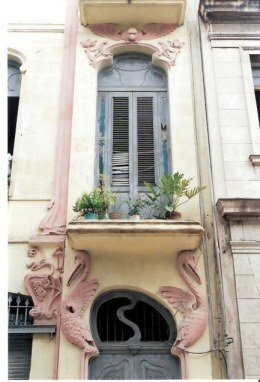 Here, there are art deco bas-relief frames doors and windows that are still lovely, even if the shutters are mended with wood of different thicknesses. 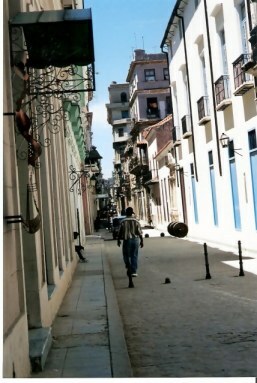 Back in the restoration area, the streets of Havana Viejo are picturesque, sometimes with old cannon balls to stop vehicular traffic in the pedestrian streets. 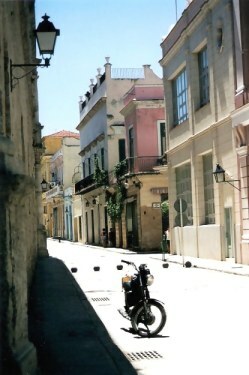 In the heat of the afternoon, most people within the old town take a siesta. The street lie quiet before the bustle of evening. Later, literally from dusk till dawn, this street-side bar will be packed with people drinking mojitos and Cuba Libre (rum and cola) and listening to one of the many musical groups that fill the streets with sound in the warm night air. But in the slow afternoon, the only person here was this man sorting through the rubble for some useful building materials to use in the un-restored part of Havana: a place where you can see the effects on a beautiful city from no investment in maintaining infrastructure. 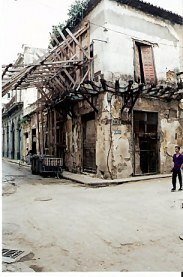 Here, the walls of a derelict, once grand, small villa are held up by wooden bracing that is obviously functional, but appears to be precarious. The verandah supports are left – but no verandah, and the carved wooden door is falling inwards. 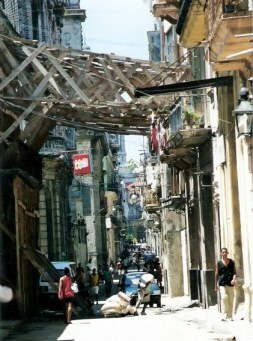 Further on there was more of this same creative style of bracing supporting walls in a central Havana side street. Note the innovative wheeled cart dragging a heavy load. It is no more than a pallet with wheels attached – but it works. and a pile of junk. These fine old buildings reminded me of grand ladies fallen on hard times and unable to refresh their tired attire. The car of the same era appears to have similar problems! 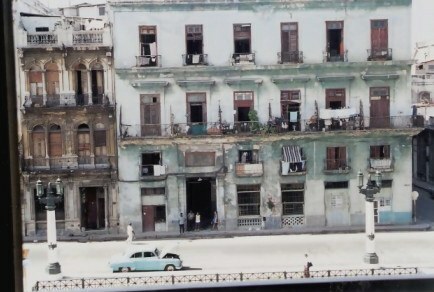 Havana is a city full of architecture reflective of the days when it was known as the 'Paris of the Antilles' – but some un-restored components still have a touch of the new. 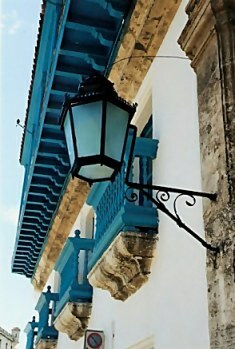 All through Havana the modified Spanish style old gas street lamps are fitted with energy-saving bulbs, like those in front of a still lovely school façade. 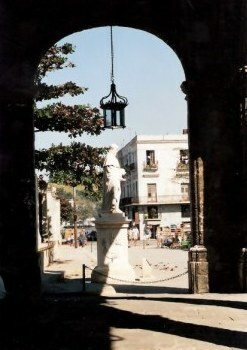 Continuing my wandering, there through an archway was Saint Francis, seeming to be crowned by a hanging iron lamp. 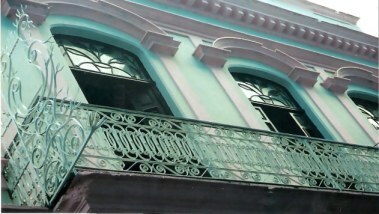 In Havana the decay of former grandeur only dims the character of the place, which for me shines through in the people – with their ever ready smiles and their ironic humour, their music, and their dance. The restoration that has been done has set a high standard that the rest of the world could emulate in attention to detail, use of art, and the way historic character is reinterpreted without loss of authenticity – and for its whimsy. 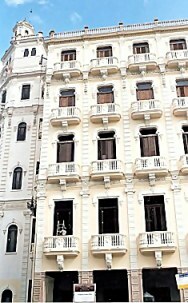 Havana is a city where the character of the place is imprinted within architecture, art, music, dance, and the warmth of the people. Once felt and not just seen, its grandeur and its personality will affect you, change you a little, and stay forever in your memory.